The Met is no ordinary art museum. Of all museums throughout the world, the Metropolitan Museum of Art is incomparable in the vastness and depth of its astounding collection spanning 5000 years of art across all cultures over the entire globe. Imagine walking through an Egyptian temple, the real Temple of Dendur, taken apart in Egypt and reassembled in the Museum. Gaze in awe at the extraordinary collection Dutch, Flemish, Italian, Spanish, and German Old Master paintings from 1250 to 1800 you’ve only seen in books from Vermeer, Rembrandt, Hals, Titian, Botticelli, Velazquez, Van Eyck. Organized in galleries by country and periods, you’ll notice how the content and style of these masterpieces reflect the times in which they were painted. See how art evolved as it moved into the 20th century in the world’s largest collection of Impressionists and Post-impressionist art – the work of Manet, Monet, Cezanne, Degas, Picasso. Travel back in time through the best of Greek and Roman antiquities and monumental sculpture. Spend time in the soaring European Sculptural Court watching how light and shadow play on large-scale classical sculptures. Enter the intriguing medieval world of ancient arms and armor used for conquest, sporting, hunting and pageantry. Experience the evolution of American culture by walking through 24 period rooms, beginning in the early colonial era. Don’t miss the 1681 Meeting Hall. Absorb the incredible beauty of the many forms of Asian art, including those associated with temples and shrines, and the many elegant and monumental interpretations of Chinese Buddhist sculpture. Connect with the diversity of cultures of Africa, Oceania and the Americas expressed through singularly beautiful art objects. See how music is an integral part of all cultures in all eras through an awesome collection of musical instruments from six continents. The story of how the Met became a major repository of incredible art from all parts of the globe is fascinating. It was established in 1870 at the beginning of the Gilded Age in America by a group of individual Americans – businessmen, financiers, artists, art collectors, philanthropists – who got together to bring art to the people of this relatively young country. This was a time of unprecedented industrial growth and great personal wealth. Those with great fortunes traveled to Europe, experiencing old world museums and private art collections. They began collecting art. Philanthropic gifts from these personal collections were the genesis of the Met. The first were 174 European paintings, among them works of Dutch and Flemish Old Masters. From that point on, the Met’s collection grew quickly. By the 20th century, the Museum had become one of the world’s great art centers. 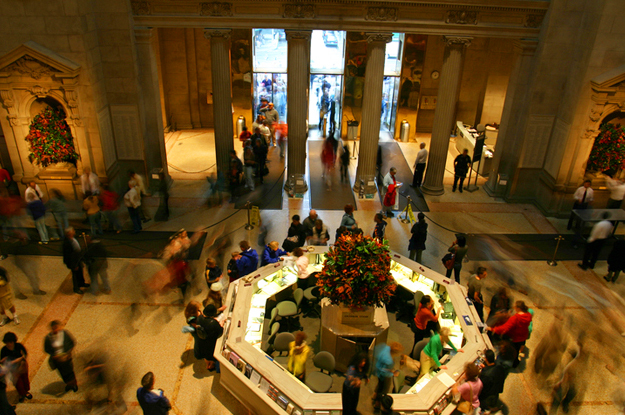 The Met is a superlative cultural and sensory experience with choices for everyone. If you’ve never been to a museum of art before, this is the one to see. If you wonder about taking kids, it’s the ultimate way to introduce great art to older children. It’s probably too much for younger ones. Don’t let its 2 million square-foot size deter you. It’s not meant to be seen all at once and in one day. To fully enjoy this amazing place, plan ahead. If you walk in unprepared, the maze of galleries and wings and people can overwhelm. Before you go, choose what you want to see in a half day, or in a couple of hours. You’re in the elegant Upper East Side neighborhood. Explore it! Enjoy being outdoors in Central Park, the great swath of green in the middle of the city which stretches out from 3 sides of the Museum. From the north end of the Museum, walk through the iconic urban green space to the sights along the 79th St. Traverse. Belvedere Castle has fabulous views, Alice in Wonderland Statue is a great photo op and open-air Delacorte Theatre, the venue for Shakespeare in the Park, a summertime fave, is great to see. From the south end of the Museum, walk through the park to Loeb Boathouse, for a weekday lunch or for weekend brunch, ornate Bethesda Fountain and Strawberry Fields, the tribute to John Lennon, on the western park boundary. Kids really like the American Museum of Natural History and the Rose Center for Earth and Space located across the west park boundary in the Upper West Side. Check out glittery upscale stores, bookstores and cafes among the lovely residences along Madison Avenue. The Met is but one of a collection of museums located within a mile of each other along this stretch of 5th Avenue. Several are housed in grand Gilded Age mansions. The Guggenheim. If you are into art from Impressionist to Contemporary, a visit to the Frank Lloyd Wright designed landmark of 20th century architecture is a must. The Frick. A small museum of fine European paintings, sculptures, 18th century French furniture and porcelain exhibited throughout the lovely Henry Clay Frick House. Neue Gallerie. German and Austrian art from the early 20th century are beautifully exhibited throughout the William Starr Miller House. The Cafe Fledermaus on the first floor is a nice place to stop for coffee and fine pastry or lunch. Jewish Museum. The Felix M. Warburg House is home to a museum of 4000 years of Jewish culture expressed through world-class art and artifacts. Cooper Hewitt Smithsonian Design Museum. This unique museum of decorative and design objects from historic to contemporary inside the Andrew Carnegie mansion is engaging for young people who think it’s super cool.